I have been thinking about the SpaceX launch since I watched it last night – and, of course, the subsequent landing – feeling inspired and excited in a way that I cannot ever recall feeling before. The last launch I watched was back in June, when the Falcon 9 was due to deliver a much-needed payload with resupplies to the International Space Station. I was shocked when the rocket exploded shortly after launch. It was a heartbreaking sight – seldom do we witness a failure so spectacular, so public. And as the video feed started, this time live from SpaceX headquarters, the energy was palpable. Much was at stake: the ostensible goal of carrying eleven ORBCOMM satellites into low-Earth orbit – a nontrivial task, to be sure. But the larger objective, for those of us who have been following the SpaceX journey, was something far grander. SpaceX was attempting to make history by being the first to land a large portion of the rocket back on Earth after delivering a payload to space. This is a big deal. The Falcon 9 is a 229-foot multistage rocket – that is, a rocket constructed from two pieces – the first stage used to blast the rocket off of the launch pad through the first leg of the journey, and the second, smaller stage intended to carry it the rest of the way. The entire assembly costs roughly $55 million to build – of that, the massive first stage accounts for 72% of the cost, or about $40 million. Traditionally, neither stage has been reusable – they are completely destroyed during the mission. If SpaceX could accomplish a return landing, they could use the first stage again for future flights. This completely changes the economics of spaceflight. 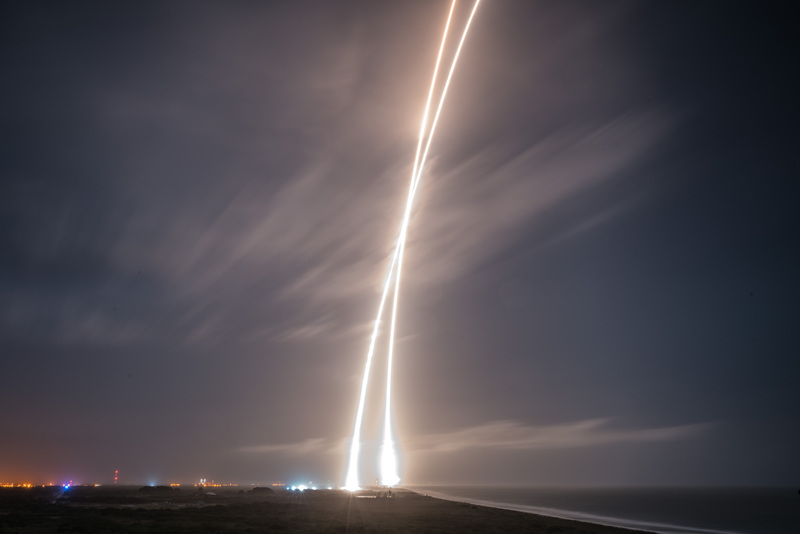 There and back again: long exposure of launch and re-entry trajectories. It is hard to explain the energy, the atmosphere, buzzing through the video feed. The look on the faces of the hosts and the excitement in their voices was unmistakable. The closest way I can describe it is that it was similar to the minutes leading up to a major sporting event like the Superbowl. But this was no long, drawn out pregame show – the feed came on just twenty minutes before the rocket’s engines were lit. And the on-camera hosts each were directly involved in the mission, plucked directly from the SpaceX rank-and-file. I knew I was in nerd paradise when the star special guest was Tim Urban from Wait But Why. The task at hand was nothing short of herculean. Tim described it as analogous to attempting to throw a pencil over the Empire State Building and trying to get it to land in a shoebox on the other side. But this was no pencil – this was a high-velocity explosive device, fifteen stories in size and weighing nearly 1.2 million pounds, filled with liquid oxygen cooled to negative 340 degrees, and the target was nothing so paltry as the Empire State Building. This rocket would reach an altitude of 124 miles – then flip around and use a series of precision engine burns to keep it from hurtling into the ground at Mach 7.5. For decades, rocket scientists have said that it could not be done. And I, tuning into this launch at the last minute, could barely contain myself. My mind kept going back to that spectacular explosion some months ago. I was swept up in the excitement, the nervous anticipation, knowing how much was a stake. Back-to-back failures would be catastrophic for the team. The launch went without a hitch and the grip of fear loosened as the rocket passed the point where, as SpaceX called it, the ‘anomaly’ had previously occurred. As the stages separated, attention turned from the mission’s primary objective – the deployment of the eleven satellites, carried on by the second stage – and all eyes were on the first stage falling back to Earth. It is hard to find the words to describe what happened next. The rocket fired a tremendous burst of thrust to slow it down, a fifteen story structure hovering in midair just above the launch pad. The seconds stretched on endlessly. And then it was over. The engine shut down and the screen was dark again, just the rocket calmly sitting on the ground as if it had never left. I cannot describe the feeling of watching it live. I was leaping up and down in front of my computer screen, clapping wildly, feeling like my heart could burst out of my chest at any moment. I guess it was similar to how people feel when their team scores the winning touchdown in the Superbowl, except this touchdown really mattered. The magnitude of this achievement can hardly be overstated. Over time, Elon Musk says this technology can reduce the cost of spaceflight by a factor of 100 – a change that would alter the trajectory of our species. There is a breathtaking six-part documentary called When We Left Earth: The NASA Missions. I have watched it many times. But it is entirely different to learn about history than to experience history as it happens. Movies will be made about this moment; our children’s children’s children will learn about it in school. Throughout the series, NASA reaches higher and higher with more and more audacious goals. Crowds gather, hold hands, cheer wildly at the victories. I can’t help but feel that we are having these moments for ourselves now, our generation’s time to triumph over seemingly insurmountable obstacles in our path – and, to be sure, fail spectacularly, publicly and together, along the way. I guess what I’m saying is that we are living in a very special time, a period that will see a pace of progress that has not happened in decades. And you don’t have to be involved professionally to be a part of it – you can just tune in and follow along as history is made around us. And amidst all the craziness that is happening in the world, projects like this…well, they just make me happy to be here. Full video of the launch is here. Hi, I’m Zack Kanter. I’m the founder & CEO of Stedi, a modern EDI platform backed by First Round Capital, Bloomberg Beta, Susa Ventures, and others. I previously founded Proforged (acquired by Huron Capital). I live in Boulder, Colorado. Follow me on Twitter @zackkanter.